YPG plate is a fixed size alternative to adjustable snap gauges. 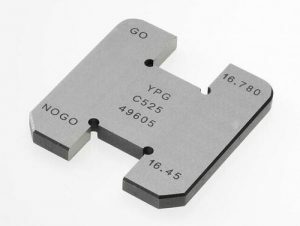 The plate gauge design is suitable for component manufacturing tolerances of 0.03mm minimum. The H design is a double sided gauge with Go and No Go features either side. Manufactured from hardened tool steel the gauge members are ground and lapped to BS 969-1982. • Both sides of the plate can be ground and lapped to act as a Go, No Go feeler gauge allowing an external groove to be simultaneously gauged on the minor diameter and width.